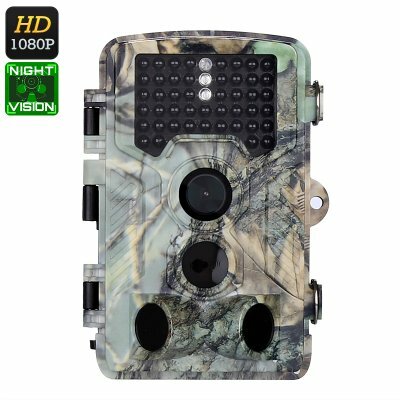 Successfully Added 1080p Trail Camera - 2.31-Inch Display, 1080p Video, 16MP Picture, PIR Sensor, 20m Night Vision, 110-Degree Lens, Waterproof to your Shopping Cart. Get ahead of the game during the upcoming hunting season with this 1080p trail camera. This hunting gadget comes equipped with an 8MP CMOS sensor and 110-degree lens. Thanks to this, it is capable of shooting crisp 16MP pictures and Full-HD video. This allows you to track the behavior of the animals in your area and analyze their daily activities and routines. From now on, you’ll always know where your game will be headed during the day – ensuring that you’ll never return empty handed from an upcoming hunting trip again. With its IP56 waterproof design and 12 months battery life, this trail camera can be used throughout the year without needing any maintenance. An ultra-fast PIR sensor is in place that snaps a picture or starts’ recording within 0.2 seconds after movement has been detected. You’ll be able to manually adjust the sensitivity to make sure it only records the animals that you’re hunting for. Your FHD trail camera furthermore comes with 46 IR LEDs. This provides you with 20m night vision so that you can analyze the behavior of your animals at both day and night. With a 32GB SD card slot in place, there is plenty of space for you to store all your recordings. Your trail camera itself features a simple 8 button design and comes with a 2.31-inch LED screen. On its display, you’ll be able to instantly watch back previously recordings and snapped pictures. Both photo’s and video can be equipped with a time stamp so that you’re always aware of the exact time and date when the animal got spotted. It furthermore comes with a built-in microphone that records sounds along with the video. For extra security, you’ll be able to lock your hunting camera by a 4-digit password. This makes sure that nobody but you will be able to access the recordings. This 1080p trail camera comes with a 12 months warranty, brought to you by the leader in electronic devices as well as wholesale hunting gadgets..